Hi everyone. Crickets around here recently. I know. Sorry!!! Life has been crazy and confusing, but I think we've got it all under control now. Believe it or not, we're moving again. I realized that if I'm not gonna be in Brooklyn (my one true love), I need to be closer to family. 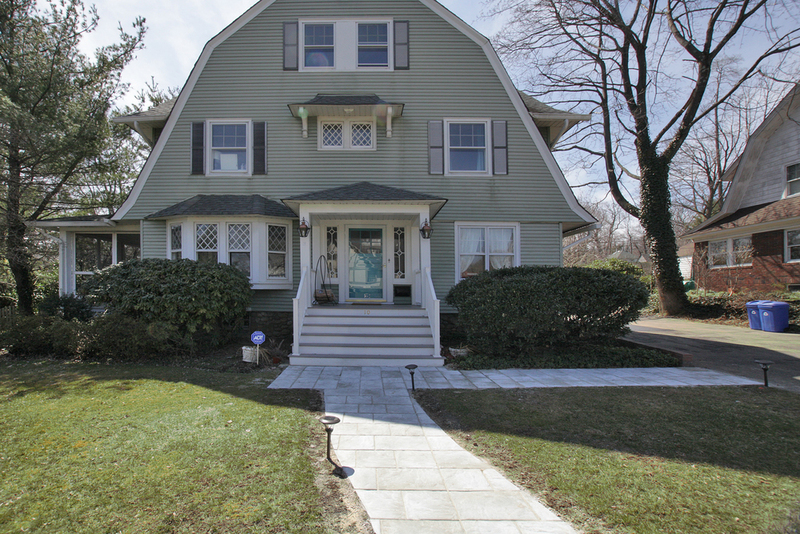 Sooooo...after buying and renovating and decorating this amazing home in New Jersey, we've already put it back on the market and are in the process of getting it sold! When we moved into this apartment, as much as I was in love with the open, newly renovated kitchen, I knew immediately we'd fill it in seconds leaving boxes and boxes of dishes, serving plates, foods, utensils, electronics without any proper place. So I decided to have some large shelves built to act as an open pantry type thing. For a long time it was filled with our glasses and plates and some dutch ovens. But recently I decided to take my mason jar filled cabinets and empty them onto the shelves. They look great if I do say so myself. And others have said so too actually. So many people have complimented me on it. I'm loving the rainbow of beans and rice and dried fruits and how they promote natural eating and cooking to all those inquisitive minds peering over. Some of the glass jars I bought, but most of them were from jars of foods I bought at the market, cleaned, and reused! Vegan Bags and Shoes Oh My! In a major effort to defrump and get my life back to a place of style and glamour (insert appropriate joke on me here), I've been seeking out new pieces to add into my wardrobe and accessories bin. I've been making a real effort to re-chic my life since gaining and losing and regaining and relosing baby weight can make a girl lose any and all interest in attempting coolness. Whenever possible, I chose vegan options for my fashion purchases. It's not all that easy (though getting progressively easier as time goes on). That said, when I can sneak new and cool vegan pieces into my wardrobe (without granolifying it too badly), I'm a happy camper. Also, I'm a bit of a Free People fanatic and I love love that they have a whole section of their site dedicated to vegan leather goods! Check it out here:) I'm swooning over oh so many of their vegan duds! Not only does reinventing your wardrobe serve you, it serves the earth;) Taking what's old and making it something new avoids adding to the piles and piles of trash we create as a society and avoids putting your money toward something that is (most likely) industrially made and new. I am so close to this concept that I actually had a business based around it: eve*lynn clothing. I bought up vintage raggy clothing and reinvented it into new stuff...from there grew a collection. I closed up the business a while back, but the idea sticks with me. I find it difficult to get rid of any old clothing because I always worry that one day I'll pull it out of the back of my closet and want to chop it up and sew it into something new. Now onto the real issue: I have an obnoxious amount of clothing! And this is not because I'm a shopping addict. It is merely because over the last 4 years I've changed sizes so many times gaining and losing weight from baby making. A ton of it I wound up giving away, but a lot of it I've not been ready to part with. For my birthday this year, I was just postpartum and feeling really ugh about my body. As my birthday gift my mom took me to Topshop to buy some new duds. Amongst all that I bought a couple jeans to hold me over until I was back down to size. Now those jeans look really silly since they're a couple sizes too large. They hug in some of the right places, but are saggy in others. I decided to experiment and in the interest of staying cool this summer and not going out to buy new shorts (it's been a while since I've been comfortable wearing short shorts), I DIY'ed myself some cut-offs. Lie the jeans flat and make sure there are no wrinkles in the fabric. Make sure you have supersharp scissors. Cut a straight line a bit longer than you think you'd like them (you can always roll or cut more, but you can't go the other way. Fold the jeans in half so that the legs are lined up. Measure the length and start cutting the other leg. 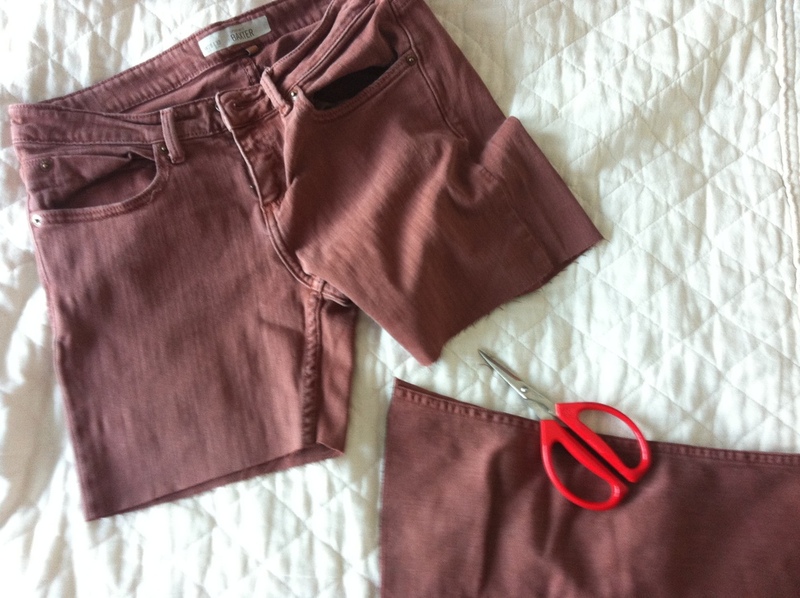 Try on the shorts and check if you want them shorter. If so, repeat. Then strut your stuff in your new shorty shorts! I'm also always looking for more eco-conscious brands. Any suggestions for me?!? Seeing as I've been doing so much working out these days, I find myself walking around in exercise gear all day (not cute). Generally speaking I'm pretty simple about my work out clothes: solids and solids and once in a while a neon sports bra to jazz it up. I'm talking leggings and racerbacks and that's about it. For yoga I'm a huge fan of American Apparel's high waisted skinny legging. You can fold over, or leave it up (dorky like me), and they're comfy and soft and not too pricey. The other day, I was bored in the house, and getting bored of my outfit, so decided to do something about it. Generally I don't keep regular bleach in the house (I only use the Seventh Generation color safe one), so I had to run out to the market to pick some up. I poured it into a high sided glass tupperware type thing and filled it to about 2" deep. Then I took my leggings and tied them up pretty tight with a number of rubber bands. Then I dipped. I only tied and dipped from about the knee down and made sure it was pretty soaked. I let it sit for only a few minutes before untying the bands and rinsing through some cool water. Then I washed them and voila!